There’s been so much focus on what next week’s 3DS game Metroid Prime Federation Force isn’t that it’s been a revelation to finally play the finished game and see what it is. In the early going, it seems like it might even be a game you can solo. Nintendo has repeatedly presented Federation Force as a first-person shooter that was designed for multiplayer co-op. Up to four players can play locally or online, each controlling a mech-suit-wearing soldier in a series of missions set in the universe of the Metroid games. The Lone Wolf mod is inaccessible if you’re playing multiplayer. 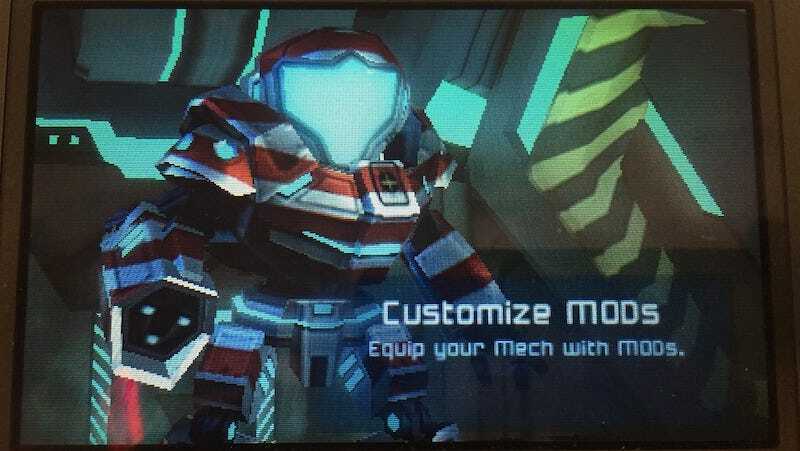 The game’s mod system lets players customize the load-out of their mechs. In the image above, you’re seeing the game’s customization screen after a play-through of the first three missions (some multiple times). Playing that much and poking around in the game’s levels produced a big bundle of mods. Some increase the damage of certain weapon types. Others increase armor or make it possible for ammo that you use to automatically replenish. A mod that revives you if you are downed seems particularly handy for solo play. Another helper for lone wolves: Federation Force lets player fill out their landing party with flying attack drones. If you’re playing solo, you can bring three along. That helps, especially if you use mods to increase their power. Here’s an official screenshot of the game so you can sort of tell what it’s like. You run, shoot and figure out your way through bases and caverns, battling enemies along the way. The levels are unlocked in order and, so far, are telling the story about the discovery of Space Pirates operating in the Bermuda galaxy. Three missions in, the game is beginning to get tough for this mostly solo Metroid player, but it’s hard to say if the climb up the difficulty curve will become uncomfortably steep. As you play you unlock better mods, especially if you thoroughly explore the game’s levels. The player’s power progression may keep pace with the rising difficulty. It’s clear, though, that the game was meant for group play. Levels encourage groups of players to split up and tackle different challenges at the same time. Playing solo means you have to do everything yourself, of course. That less efficient way of moving through a level will surely make it harder to hit the game’s optional but rewarding level completion time targets. One thing that may help lots of players, solo or otherwise, is playing on a New 3DS. It allows you to play the game as a standard dual-analog FPS via a secondary control scheme. The default scheme requires you to tilt the 3DS to aim up and down. That’s not terrible, but is certainly not customary to the genre. Controller configuration A is the only option for people with a standard 3DS. Tilt the 3DS to aim up and down. Config B is a good option if you have a New 3DS and would prefer to aim up, down, left or right with the system’s analog nub. We’ll have more about Metroid Prime Federation Force, including a review, next week. Bonus screenshot: Say hi to Samus, everyone. She may not be the main character but they haven’t forgotten her.